The Jeanneau NC11 won the coveted European Powerboat Of The Year Award in 2011 but remains as fresh and relevant today as on debut. Jeanneau Yachts quickly followed the success of the NC11 with the smaller, yet no less impressive, Jeanneau NC9 a year later, completing a beautiful and desirable range of cruisers from nine to 14m. Their innovative design and premium construction combine traditional Nordic seafaring experience with the elegance of Mediterranean waterside terrace apartments, and while they may have European flavour and panache, they fit exceptionally well into the Australian boating market. We revisited both models at the Australian home of Jeanneau sports cruisers, Matthew Willett Marine on the central Sydney North Shore moorings in D’Albora Marina at The Spit in Mosman. On the Jeanneau NC11, the European designers certainly hit their target. The Jeanneau NC 11’s stylish presentation will appeal to fastidious owners, and those with nautical experience will celebrate an extremely user-friendly layout. 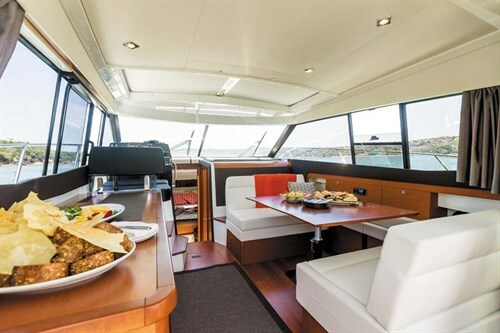 The Jeanneau NC11 has terrific ‘flow’ throughout, whether from the outer decks and bow or the convertible cockpit and boarding platform, through the wide-opening saloon doors that bring the inside out and the outside in, and carry on to a versatile cabin and helm, before finally heading downstairs to the twin staterooms and bathroom. I find many European minimalist finishes lacking in quality and detail, often using the excuse that fashion defies practicality. Not Jeanneau! This is a well thought-out boat with attractive yet sensible materials and finishes, and a rather unique layout that is full of innovative surprises. She lures you with a warm and comfortable atmosphere that, while certainly compact, has a very bright open and airy feel everywhere. There are plenty of windows, and the high headroom throughout the lounge is enhanced by a large electric Webasto sunroof over the helm. The warmth on the Jeanneau NC11 starts from the moment you board over the short but functional teak-lined (optional) stern platform. The ample Mediterranean Deck is on the same level as the platform, enhancing the external space. The gunwales are nice and high and the area is well confined once you close the rear gates. I really liked the convertible bench seat; mounted on slides to adjust the positioning, it can be used as either a comfortable lounge or a relaxing sunbed. The cockpit floor includes generous hatch access to the engine well that houses a pair of Volvo D3-200HP marine diesel engines powering Duo Prop stern drives. The enginewell is large, beautifully fitted and neatly plumbed, and allows easy access both for regular maintenance and long-term servicing alike. The three-piece French-style saloon doors open wide from either direction, creating an al fresco entertainment space. Walkways either side of the cabin lead to the foredeck; to port it’s offset further than starboard, making it the preferred route. There is a further detachable sun lounge on the forward cabin roof (optional) and plenty of room to move around the short bow’s fittings and Lewmar electric anchor winch. I was particularly pleased to find a lateral sliding door at the helm on the port side. It not only provides quick access to the side decks for a single-handed skipper but also adds to the open feeling and ventilation of the saloon. The internal layout is innovative and functional, with the individual helm to the port side and a credenza masked galley behind. It features a two-burner gas stove with grill, stainless sink with mixer tap, compressor bar fridge and optional microwave all combined in teak cabinetry with leatherette trim, storage and the switch panel up front. To starboard, the large convertible dinette not only provides a terrific table for a banquet but each of the fully upholstered leatherette seats tilts forward or back to create extra beds, as well as becoming a dual passenger seat and rear-facing lounge to accentuate the entertainment value of the cockpit. Most inventive! The helm position is really quite good considering its rather compact nature. It is suitably comfortable and allows good visibility all around from the elevated upholstered bench. 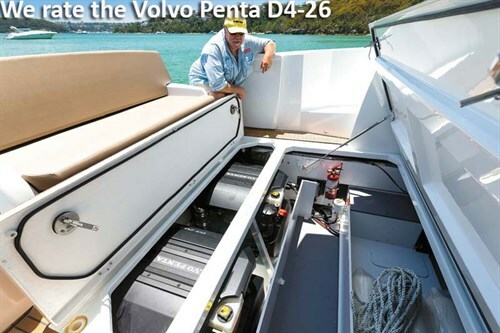 Our review boat was fitted with Volvo Penta electronic dual binnacles with the option of single-lever control, trim assist and cruise control, plus Volvo Penta digital engine readouts combined with a complete set of analogue gauges. Jeanneau offers joystick control as an option – but at $25,600 extra, I wouldn’t bother. She’s a breeze to manoeuvre in and out of tight moorings with the flexibility of twin engines plus the optional bow thruster. There are Lenco trim tabs, VHF radio and optional Raymarine electronics, this one with an E97 12in multi-function screen. The internal presentation is quite sporty but with a "warm contemporary ambience"; the leather-wrapped stainless Jeanneau-embossed steering wheel, Alpiwood panelling, ebony and ivory Devon leather upholstery and white-lined ceilings enhancing both the polished fibreglass areas and moulded black surfaces. Underfloor are a pair of very large storage hatches, big enough for an inflatable boat with engine and a heap of other gear. Downstairs is inviting yet compact. 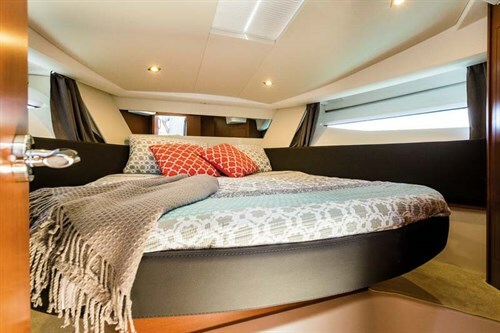 The forward berth has a full island bed with wardrobe storage, while the second stateroom features an east/west double with storage to starboard. Large windows add to the ambience internally, and also boost the external appeal. The bathroom has a saltwater flushing head, plus vanity with a pull-out rose for the wet-area shower. The trim is simple, neat and stylish with a good array of drop and mood lighting found throughout. Prefer a slightly smaller boat? 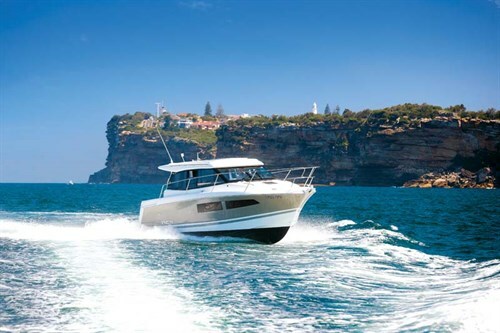 The Jeanneau NC11’s little sister, the Jeanneau NC9, is a practical and satisfying sports cruiser. The NC9 packs all the style, grace, facility and good looks of her larger sibling in a boat 9.43 metres long overall, with 3.15 metres beam. She doesn’t really feel the considerable 590mm skinnier than the NC11’s 3.74 metres but there’s considerably less weight to push (4830kg dry displacement) and the gutsy Volvo Penta D4-260HP four-cylinder, common-rail injected, double overhead cam, turbocharged and aftercooled diesel provides terrific performance up to a quoted optimum speed of 25.9kt at 3650rpm, drinking just 49.6 litres per hour. Fuel consumption drops to a very comfortable 40L/h at 3200rpm, for a terrific offshore cruising speed of 21.25kt. More importantly, you can rest assured it has the power to take the family out for a day of fun and thrills, and bring ’em home safely. Whilst obviously smaller, she hasn’t lost much of the voluptuous appeal. The biggest differences are that she’s considerably shorter in the rear deck and platform, the second stateroom and bathroom are reversed; she comes standard with twin manual sunroofs (Webasto electric is an option), and Lenco trim tabs are fitted as standard, giving the operator full control no matter the wind and sea direction and load movements. This terrific Jeanneau package retains all the other features, albeit in a slightly more compact package. 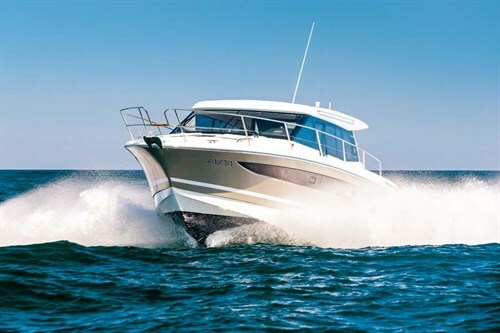 I was pleasantly surprised by the performance of both Jeanneau yachts, but the power, weight, torque, manoeuvrability and overall grunt of the twin-engine Jeanneau NC11 certainly put a smile on my dial. The solid, hard-chined full fibreglass monohull is spritely out of the hole and is unexpectedly nimble for a boat of 5925kg dry. She’s just a little hard into a choppy head sea but that’s to be expected from a sports/cruising monohull combination where stability is a major factor. We took her out through Sydney Heads and into some slop where she performed with nothing but confidence right through to a quoted top speed of 30.5kt at 4000rpm, at which she was drinking 82.12 litres per hour in optimum conditions. Drop to a more realistic cruising speed of 25.25kt (3400rpm) and she sips a thrifty 56.72 litres per hour. 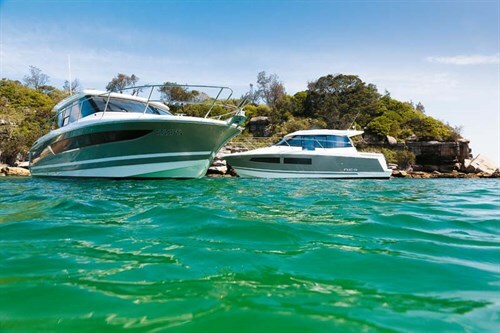 The Jeanneau NC series sports cruisers have been a massive success for Jeanneau, completed by the larger NC14 that has proven popular internationally and enjoyed good acceptance, with four boats delivered in Australia. 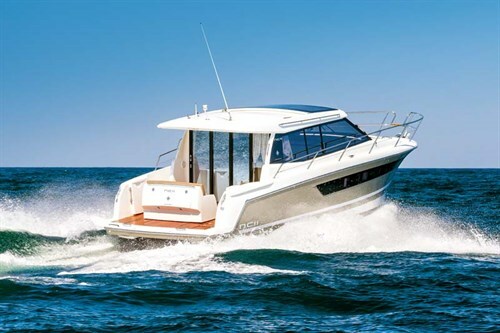 Jeanneau has now sold a massive 260 NC11s and 164 NC9s worldwide, which gives customers and dealers alike total confidence in a well-accepted and well-constructed product backed by a nationwide service network. The Jeanneau giant produces a massive range of power and sailing craft, ensuring prolonged dominance and security in an often rocky marine marketplace. See the full version of this review in Trade-A-Boat #264, on sale March 24, 2016. Why not subscribe today?